Tonally the Piano Concerto recording was good in this stereo version (possibly offering a different tone to the mono release reviewed above), if somewhat hissy, and this restoration has concentrated mainly on reducing the latter as well as correcting some quite significant pitch anomalies at edit points throughout the recording. These caused jumps in the pitch of the recording were edits from different takes had been made or up to a quarter-semitone at a time, helping make some edits sound particularly clunky. The recording was also rather sharp, more so than the Diabelli Variations, which managed a far more even and consistent A=445Hz. Here my efforts were concentrated on lifting the veil on a somewhat thin and boxy-sounding instrument, coupled with the removal or suppression of a large number of extraneous clicking noises which appeared to emanate from the keyboard itself. This is the first disc in a new Decca series called "Immortal Masterpieces". BRs have a bright blue label (the colour of old Columbia LXs) and come packed as usual in the stiff polythene envelope and stiff glossy sleeve—this one has a small coloured reproduction of "Rocky Landscape" by Brill—but without programme notes on the back. Most of the first 10 BRs are old friends, but Backhaus's version of the C major concerto appears to be new. The concerto has usually been issued as a 12-incher, mostly with a fill-up. Serkin, in a now deleted Philips, got it on to ten-inch format by galloping the first movement; Backhaus doesn't need to do that—he and Isserstedt take it rather slower than the fine Solomon/Menges (H.M.V. ALP 1583) performance. But Backhaus plays the Largo as a rather Schubertian Andante, which no doubt helps him to get the last two movements on to one side. It's a dashing, mettlesome performance, well poised; I had forgotten how lively and companionable a pianist Backhaus could be (I'm not a fan of his readings of the last three concertos), and the performance reminded me that he used to be an admired Mozart pianist. The florid runs and the sense of shape are particularly good; I only didn't care for the extensive meno mosso which Backhaus declares before the Adagio in the coda of the last movement— it overweights the music. The piano tone is inclined to glare at you, and the range of orchestral tone is a bit small. Perhaps that explains the popular label; musically it's an agreeable performance, smartly accompanied..
Having completed the whole cycle of Beethoven's piano sonatas Backhaus will now, I imagine, and hope, add the finest of the remaining keyboard works. His performance of the "Diabelli" variations is a magnificent achievement: and it says a great deal for Katchen's much more youthful art that his own performance stands up so well to it and may even be considered, in the final variation (and the wonderful modulation that leads up to it) more spiritually radiant. But Katchen, naturally, does not command the grand manner of Backhaus, which is of the master's time ?nd not of to-day ; nor can one expect of him the maturity born of a lifelong experiencv. Comparisons, therefore, would be, as is said, odious. There is an astonishingly youthful vigour in Backhaus' playing, a tremendous sense of enjoyment in the formidable task of bringing the great work to life, and a moving sensitivity in those variations that call for it, particularly in the lovely Chopinesque Variation (No. 31). I must also single out the superbly clear and vital playing of the following fugal variation. 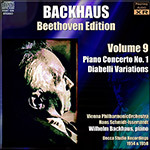 The piano tone is on a level with the best we have had in the Backhaus series.